A WTP uses two FLUMPs to produce 22 million gallons of treated water daily. SRS Crisafulli. "This letter is to inform you of our success using SRS Crisafulli standard duty flumps to remove settled solids from two of our primary settlings basins at the Hanahan Water Treatment Plant. The two basins were built around 1904 and had no provisions for removal of settled solids other than draining the entire contents. These basins contain approximately six million gallons each and produce twenty-two million gallons of treated water per day each. The draining of either of these units every four months caused immense loading problems for our solids handling facility, not to mention the loss of a major portion of our water production capacity. This often occurred during peak demand periods when volume and water quality were critical." "We purchased a standard duty FLUMP and removed and replaced the cutter head with a siphon manifold. We were able to remove solids at a rate of 300 to 500 gallons per minute on a daily basis without affecting water quality. Shortly, we purchased a second FLUMP and made the same modification. The use of these two units has allowed us to solve two major problems at the Hanahan Water Treatment Plant - (a) keeping the two major basins in service while we remove solids on a continuous basis, and (b) eliminating a frequent solids loading problem enabling our solids handling facility to function as designed without overload. Now, with the use of the modified standard duty FLUMPS, we only drain the basins annually for a scheduled routine cleaning and maintenance." "We have been very pleased with the service that these units have provided and would recommend them to anyone having a similar problem." This transaction was handled by two salespersons who are now distinguished alumni of SRS Crisafulli, Ryan McHale and Carl Richards. The City of Charleston took the FLUMP Systems out of service in 2010 when they built a tertiary treatment process and retired their settling basins. 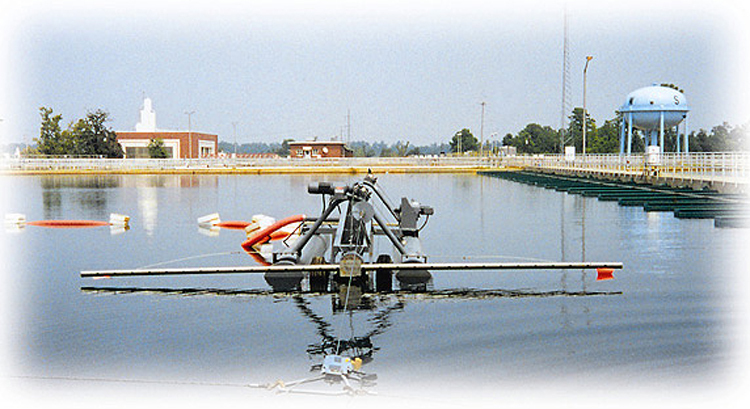 The Hanahan Water Treatment Plant is the largest in the state of South Carolina. The plant is located on a 60-acre site on the banks of the Goose Creek Reservoir in Hanahan, South Carolina. They run an award winning public utility.